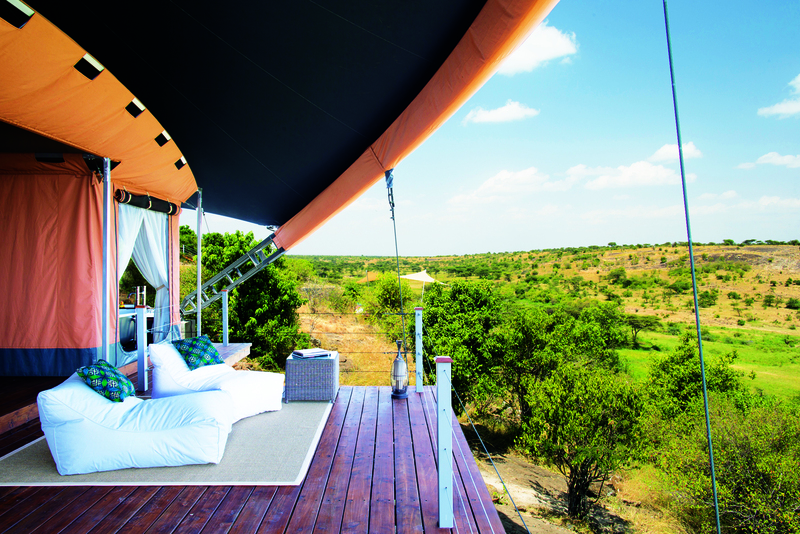 Each 'tent' at Mahali Mzuri has a private viewing deck. Not a bad view to wake up to, is it? Buffalo wallow in a water hole in front of us, baboons skip and impala graze under acacia trees nearby and we know lions are staked out on the hill opposite because our Maasai guides have been keeping an eye on them all morning as they saunter across the ridge. We are tucking into a crisp pizza with beetroot salad for lunch on the deck of Mahali Mzuri, Sir Richard Branson’s Kenyan safari camp, when the word goes out: the lions are on the move. Binoculars in hand, we watch eagerly as nine graceful felines stroll east along the rocky ridge. There’s really no need to go on game drives when you have a ringside seat to the prolific local wildlife from the comfort of a five-star camp. But we have already organised an afternoon drive with our Maasai guide, John Kaelo, who now knows exactly where to head to find some lions. As we set off, the heavens open – apt given it is the rainy season. John secures the plastic roll-down blinds on our safari cruiser. “Lions love the rain,” he says. “They love to gambol and play.” We stop till it eases and hear the plaintive cry of a baby mongoose apparently abandoned by its family. Its calls are soon answered and it’s reunited once more. John positions the vehicle by a quiet stream in the hope the lions are headed this way. Almost on cue, they appear and take up lookout positions like furry sphinxes high on the bank opposite. Two young ones break rank and bound down the hill towards us, cavorting and wrestling each other in the wet grass. It is the kind of thing you would normally imagine seeing with a voice-over from Sir David Attenborough, so unique an experience it is. But today we are the only humans privy to this rare and magical scene. I had flown in by light aircraft the day before from Nairobi to the remote Mara North airstrip where the welcoming committee comprised warthog, baboons, zebra and ubiquitous impala. John, dressed in the traditional Maasai red shuka, had poured us a welcome champagne before we headed for the camp on what was really an hour-long game drive over the vast flat plains. The only people we meet are a handful of semi-nomadic Maasai tending their goats; their signature crimson red garb starkly contrasted against a leaden, rain-filled sky. Mahali Mzuri, which means ‘beautiful place’ in Swahili, is spread along a ridge above a lush green valley that forms a natural grandstand for wildlife viewing. The verdant, grassy valley is the watershed for the annual mass migration of up to a million wildebeest plus hundreds of thousands of zebras and gazelles that travel the 1600 kilometres from Tanzania to Kenya funneling through the Enchirtit Gorge immediately in front of the camp, and up onto the surrounding Loita Plains. Today, a consortium of five safari camps lease the Motorogi Conservancy and the neighbouring Olare Orok Conservancy, which together cover some 13,500 unfenced hectares. The rent to the Maasai, as well as a tax of $5 per person, per night, goes directly to the trust. There’s a strict quota system and the project is proving a win-win situation for all concerned: the land is protected, the Maasai earn an income and visitors get to see the abundant game in peace, just as nature intended. “Because the land-owners have legitimate representation [in] the management company at board level, [that] is what makes this model work,” adds Liam. “Africa has had the worst poaching figures in 30 years, yet in the last three years in our direct conservancy the figure has been zero. Not one animal has been poached,” he adds. With a conservancy goal of “low-density, high-value tourism”, Mahali Mzuri is well away from the throngs of safari vehicles that can often mar wildlife viewing in this region and delivers on all counts, accommodating just 24 guests in 12 spacious tents, including two set up for families. The tents are designed by Nairobi tent-maker Jan Allen – whose designs for his mother Sue’s innovative camp, Ol Seki Hemingways Mara Camp, set a new standard in safari accommodation when it opened in 2005. Similarly, the Mahali Mzuri tents are ultra modern, almost alien-looking – stylised pith helmets, perhaps, whose rust and grey palette is based on the colours of the local antelope, the topi. The dining room and lounge tents or olpul (Maasai for ‘feasting place’) reflect the beige and grey colours of the Thomson’s gazelle. Restful yet atmospheric interiors using individual feature fabrics are courtesy of UK-based interior designer Yvonne Golds of Real Studios who also designed the new luxury Berber tents at another Branson property, Kasbah Tamadot. Each has a spacious bedroom, ensuite with shower and luxurious bathtub, outdoor lounge and expansive covered terrace with lie-on-me lounges, perfect for game spotting while in repose. Tents are set apart from each other ensuring privacy and seclusion and adding to the feeling of isolation of the magical setting. The new camp joins Branson’s illustrious Virgin Limited Edition stable that includes Ulusaba Private Game Reserve in South Africa, Kasbah Tamadot near Marrakech in Morocco, and Necker Island, his private Caribbean retreat where celebrities and royalty choose to vacation. It’s no accident that Branson’s latest venture is in the Maasai Mara – the businessman-adventurer-philanthropist was made a Maasai elder in 2007 when he inaugurated Virgin Atlantic flights from London to Nairobi. He donned his own traditional red shuka when he officially launched the camp last October. Cleverly, Branson installed the Breedveld brothers to run the property, and they make a formidable team: Tarn who has a double degree in Science and Arts with majors in anthropology, archaeology, botany and zoology has run anti-poaching teams in Tanzania for four years; Liam is a qualified chef with 15 years’ experience in establishments such as the Michelin-starred The Square in Mayfair, Nobu and Le Manoir aux Quat’ Saisons, and has worked for various Branson properties over the last eight years. They are joined by Australian chef Johnny Visser who spent time in the London kitchen of Restaurant Gordon Ramsay in Chelsea and is developing an on-site kitchen garden at Mahali Mzuri. He fuses Maa (Maasai) and Kenyan flavours with modern techniques to produce restaurant-style dishes with a sense of place: soy-glazed roast breast of ostrich with coconut polenta chips, locally smoked kingfish carpaccio with a delicate Zanzibar kachumbari (onion and tomato salad) or Maa-style lamb ragout with Kenyagi, a local version of bubble and squeak. In between big game, eating and rest there are ample diversions: one day we opt for a morning game walk with an armed guide and Maasai askari for protection; we visit a local Maasai village where we are invited into the locals’ cosy circular huts to sit by the warming fire; I indulge in a Maasai-inspired orinka stick massage in the Nasaro Spa; or simply cool off in the swimming pool that is cantilevered over the valley. While breakfasting on our last day, John points out a leopard settling itself in a tree as a herd of wildebeest descends into the valley. “It’s waiting to ambush any babies at the rear of the herd,” he suggests. But the wildebeest get wind of the canny feline and head back in the direction from which they came, and the leopard finally lopes off in the opposite direction, still hungry. Next time, I’ve decided, I’m going to skip the game drives and watch all the incredible wildlife action from the comfort of my own tent, the pool or perhaps even my bath-tub. Thai Airways (thaiairways.com.au) has several daily flights to Bangkok, with onwards connections to Nairobi with Kenya Airways (kenya-airways.com.au). Safarilink operates a shuttle from Nairobi’s Wilson Airport to Mara North, from where it is a 45-minute safari game drive to the camp (flysafarilink.com). The Maasai people are among the most decorative in Africa. Bring home colourful bead-work or shanga: necklaces, bangles or placemats. Mahali mzuri I think is a good place that I can explore and advance my career in tourism. The scenery, hospitality and food here is just amazing..just love this place.